The Contact Page includes the essential details of a contact such as the name, email, phone number, address, contact persons, transaction synopsis and recent activities. 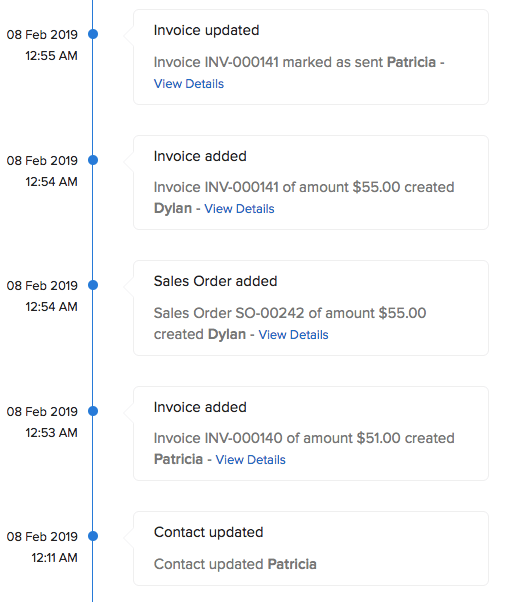 This page also provides actionable buttons and quick links for creating a new transactions, recording payments, sending emails and statements. It is the first page that you’ll see after you’ve created a contact or when you click a contact name. Below are the sections that constitute the overview page of the contact. 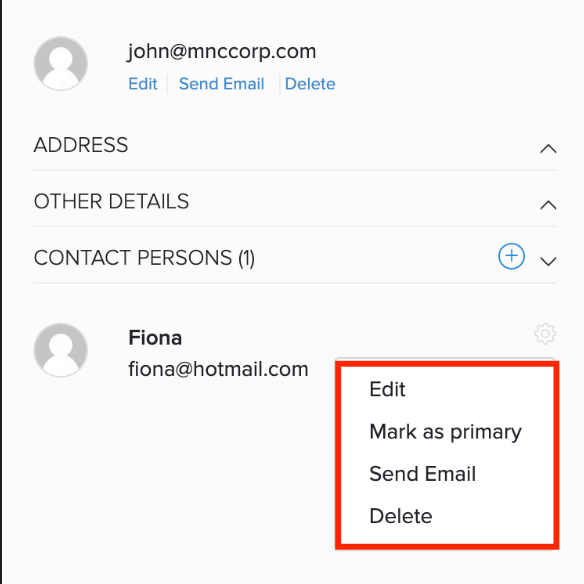 The first block of the Overview page displays the basic details of the primary contact such as the name, email address and phone number. The Address section shows the billing, shipping and the additional addresses associated with the contact. Learn how you can manage addresses for a contact. 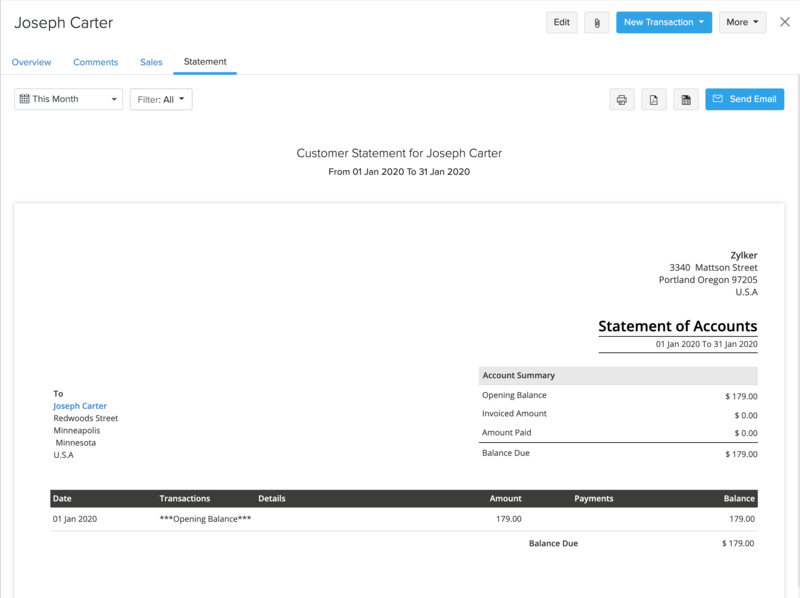 The Other Details section displays the Currency Code, Payment Terms and tax related details of the contact. The Contact Persons section is where you add alternate contact persons who you can get in touch with if the primary contact is unreachable. 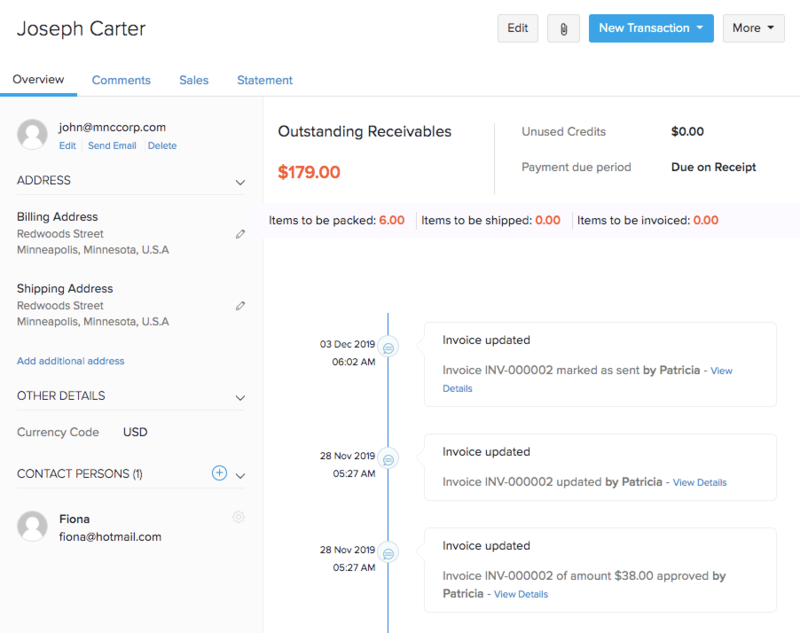 For a customer contact, you can find the Receivables section where details regarding the customer’s impending payment, credits available, and sales related details are displayed. 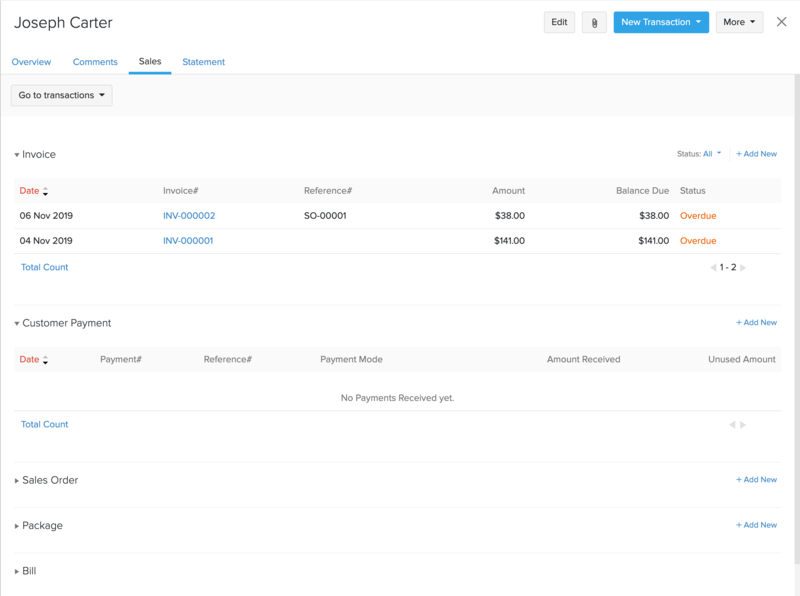 In case of a vendor contact, you can find the Payables section which displays the amount you owe them and your purchase related details with that vendor. Below the Receivables section, the recent shipments sent to the customer along with its status will be shown. Click the package number to view the details of the shipment. Lastly, you can find the recent activities section with the most recent activity shown first. A contact person or an alternate contact is someone who is associated with the primary contact and can be reached in case of business related queries. Go to the Contact Persons section at the bottom of the Overview page. Enter the relevant information about the contact person. The recent activities for a contact is displayed in a timeline fashion, showing the most recent activity first along with the name of the user responsible for the action. These activities include contact created, contact update, invoice created, payment made and more. Under each activity, you can click the View Details link to get into the details of that activity. This section allows you and the users of your organization to add internal comments about the contact. A comment can be viewed by all users in your organization. The list of all transactions created for a contact can be viewed here. You can filter the list based on the transaction type and status. You can also click the transaction number to view its details. Click to open a contact of your preference. Opening Balance: Total amount carried from the previous period of unpaid invoices. Invoiced Amount: Total amount from the invoices (paid and unpaid) created during this period. Amount Paid: Total payment amount recorded for the invoices during this period. Opening Balance: Total amount carried from the previous period of unpaid bills. Billed Amount: Total amount of the bills (paid and unpaid) created during this period. Amount Paid: Total payment amount recorded for the bills during this period. Insight: The balance due will be carried forward to the next period as the opening balance. Click to open a preferred customer. Select the period for which you want to generate the statement. Click the respective icons at the top-right corner of the page to download a PDF, take a print or to email the statement to the contact.